Hesselbart's "The Dumb Things Sold... just like that"
Well, at least you're up off the ground! Mark and his sisters camped here! chair on the back porch to enjoy the breeze. "If you don't fulfill your dreams now, when will you?" Early June, 2009 - We left the Detroit area for a southern loop tour. then return in the morning to extinguish them. What a hike! his fifth keys-locked-in call of the day. at a course catalog. No such luck: today's students just go online. We had driven along Lake Erie to visit the Tartan sailboat factory. through the Caribbean to the South Pacific. now, it had certainly known some extremely flush times in recent years. towering plate glass windows looking out at the pretty acreage all around. to get a good look. is the oldest travel trailer in the world. out of the front and back. and had just as much fun as we do today. from the 1930's until 1988. "Hard sided" trailers were popular too. exterior of this trailer is "genuine leatherette"
coated canvas stretched over tar paper. common in all RVs today. hose leading into the sink. West's chauffeur driven Housecar, custom built to take her to and from the movie sets in 1931.
icebox and hotplate stove for making tea, and it carried a rocking chair on the "back porch"
where she could enjoy the breeze. paint, everything is 100% original. changes, eliminating the boat-tail end and moving the entry door. how it all folded in on itself for travel. honoree rather than the name of the company. magazines for some of the trailers we had just seen on the Road Back in Time. 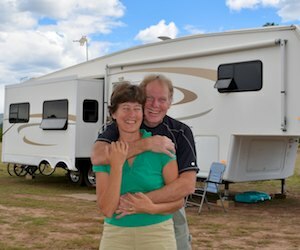 campground etiquette, how to keep the kids happy, and maintenance on every part of a trailer or motorhome, among other things. Thank you, Kay, that is timeless advice! This entry was posted in Indiana and tagged Indiana, Shutterbug, Travel, USA by Roads Less Traveled. Bookmark the permalink.